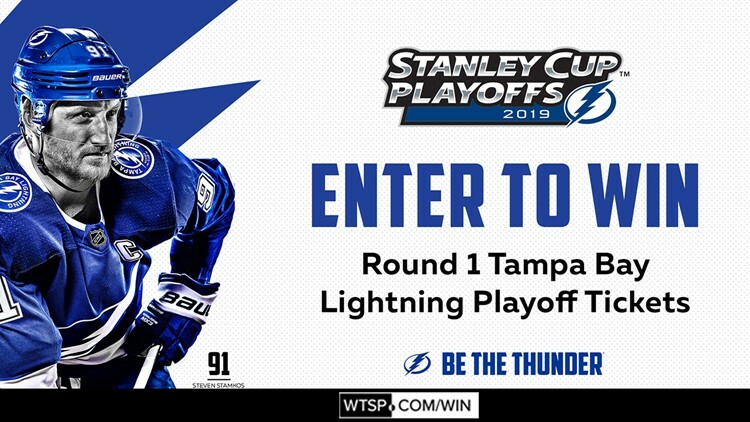 Win Tampa Bay Lightning playoff tickets! 10 News and the Tampa Bay Lightning want to put you and a guest into the stands for game 2 of the first round of the 2019 Stanley Cup Playoffs, at Amelie Arena. GO BOLTS! 10 News and the Tampa Bay Lightning want to put you and a guest into the stands for game 2 of the first round of the 2019 Stanley Cup Playoffs, at Amelie Arena. Enter below or visit www.TampaBayLightning.com/10News to enter for your chance to win. Enter April 4th through April 11th! NO PURCHASE NECESSARY TO ENTER OR WIN. A PURCHASE or payment WILL NOT INCREASE AN ENTRANT’s CHANCES OF WINNING. ODDS OF WINNING WILL DEPEND ON THE TOTAL NUMBER OF ENTRIES RECEIVED FOR THE APPLICABLE DRAWING. VOID OUTSIDE FLORIDA AND WHERE PROHIBITED BY LAW. The Lightning Playoff Ticket Sweepstakes (“Sweepstakes”) is sponsored by Tampa Bay Arena, L.P. (“TBA”, “Sponsor” or “Operator”) and is subject to these official rules (the “Official Rules”). Sweepstakes Period. The Sweepstakes begins at or about 9:00 AM Eastern Time (“ET”) on April 4, 2019 and ends at 11:59:59 PM ET on April 11, 2019 (“Sweepstakes Period”). The Sponsor’s computer is the Sweepstakes official clock. Eligibility. Sweepstakes is open only to individuals who are legal residents of the United States, who are eighteen (18) years of age or older, and physically reside within fifty (50) miles of AMALIE Arena, 401 Channelside Drive, Tampa, FL 33602 (the “Arena”) and are not otherwise barred by law from participating in the Sweepstakes at the date and time of entry. Employees, officers, directors, agents, representatives and volunteers of Sponsor, Lightning Hockey LP (“Lightning”), WTSP CBS (“WTSP”), and any other entity directly involved in the development or administration of the Sweepstakes, and the members of their immediate families (defined as spouses, parents, siblings, and children) and households, are not eligible to enter or win. The term "household" includes all persons residing together (part-time or full-time) in a single residence, whether or not related. Sweepstakes is subject to all federal, state and local laws. Sponsor shall be entitled to interpret these Official Rules as needed — including but not limited to rules regarding deadlines, winner selection, prize restrictions, and eligibility — and all such decisions are final. By participating, you irrevocably, fully and unconditionally agree to be bound by these Official Rules and waive any right to claim ambiguity in these Official Rules and/or in any other Sweepstakes and/or Sweepstakes-related advertising or materials. How to Enter. During the Sweepstakes Period, visit www.TampaBayLightning.com/10News on your computer or mobile device, follow the instructions to complete an official Sweepstakes form with all required information, which may include your name, e-mail address, phone number, age or date of birth (the “Required Information”) and complete the transaction to receive one (1) entry. Entries must be received by 11:59:59 PM ET on April 11, 2019 to be eligible. If you choose to enter using your mobile device, standard data rates apply. Each wireless carrier’s data rate plan may vary, and you should contact your wireless carrier for information on data rate plans and charges relating to your participation in this Sweepstakes. Participants who fail to provide any Required Information may be disqualified without further notification by Sponsor. Sponsor is not responsible for entries that are lost, misdirected, garbled, distorted, truncated, incomplete, illegible, incorrect, altered, tampered with, counterfeit, unauthenticated, or late for any reason, and all such entries are void. Sponsor reserves the right in its sole discretion at any time to disqualify any entry that, or participant who, does not comply with these Official Rules in its sole discretion. Random Drawing. The potential winner of the Sweepstakes will be selected by random drawing following the Sweepstakes Period on or about April 12, 2019 from among all entries received. Subject to verification of eligibility and compliance with the requirements below, the potential winner will be declared the official winner of the Sweepstakes (the “Winner”). The decisions of Sponsor are final and binding on all matters relating to this Sweepstakes. Odds of winning depend on the total number of entries received. Prize. One (1) Winner will be awarded two (2) tickets for Winner and his/her one (1) guest to Round 1 Game 2 of the 2019 Stanley Cup Playoffs hosted at Amalie Arena, 401 Channelside Drive, Tampa, FL 33602 (the “Prize”). Total Approximate Retail Value (“ARV”) of the Prize is $200. Date and time to be determined by the National Hockey League at its sole discretion and may be subject to change. TRANSPORTATION TO/FROM THE GAME NOT INCLUDED. Seat locations at the game will be determined in the sole discretion of Sponsor. Prize Conditions. All Prize details will be determined in the sole and absolute discretion of Sponsor. Winner is fully responsible for any and all applicable federal, state, territory, and local taxes (including income and withholding taxes). Any person who wins prizes through any TBA-sponsored promotions with cumulative value equal to or greater than $600 in a calendar year will receive an IRS MISC 1099 form or other required tax form. All costs and expenses associated with the Prize acceptance and use not specified herein as being provided, including but not limited to transportation costs, meals, gratuities and other expenses incurred by accepting the Prize are the sole responsibility of the Winner. The Prize is non-transferable and non-assignable, with no cash redemptions except at Sponsor’s sole and absolute discretion. Sponsor reserves the right to substitute the Prize (or any portion thereof) with a prize of comparable or greater value at its sole and absolute discretion. Any such changes will be announced. TRANSPORTATION TO/FROM THE GAME NOT INCLUDED. Tickets may be subject to certain terms and conditions specified thereon. Seat locations at the game will be determined in the sole discretion of Sponsor. Winner’s guest must be of legal age of majority in their jurisdictions of residence (and at least eighteen (18) years of age), unless accompanied by a parent or legal guardian. National Hockey League game, event and exhibition dates and times are determined in the sole discretion of the Office of the Commissioner of Hockey and/or the applicable National Hockey League Club, as applicable, and may be subject to change. The terms and conditions of the tickets awarded as part of the Prize will govern in the event a legal game, event, or exhibition, as defined by the National Hockey League, is not played or held, as applicable, due to weather conditions, an act of God, an act of terrorism, civil disturbance or any other reason. Winner and his/her guest agree to comply with all applicable arena and venue, as applicable, regulations in connection with the Prize. Sponsor reserves the right to remove or to deny entry to the Winner and/or his/her guest who engage(s) in a non-sportsmanlike or disruptive manner, or with intent to annoy, abuse, threaten or harass any other person at the game, event or exhibition. Released Parties (defined below) will not be responsible for weather conditions, Acts of God, acts of terrorism, civil disturbances, work stoppage or any other natural disaster outside their control that may cause the cancellation or postponement of any National Hockey League game, event, or exhibition. National Hockey League game, event, and exhibition tickets awarded as Prize may not be resold or offered for resale or used in any way for commercial or promotional purpose whatsoever. Any such resale or commercial or promotional use may result in disqualification and Prize forfeiture, and may invalidate the license granted by the game, event or exhibition ticket(s). Notification. The potential winner will be notified by Sponsor by telephone at the phone number provided at the time of entry. Notification is deemed to have occurred immediately upon placing of a phone call by Sponsor to a potential winner (the “Prize Notification”). Sponsor is not obligated to leave voicemail, answering machine or other message. If the potential winner does not answer Sponsor’s phone call, the entrant will automatically be disqualified and their prize will be forfeited, no alternative prize will be substituted. Sponsor, in its sole discretion, reserves the right to select an alternate qualifier and/or potential winner at that time. In the event that any potential winner does not respond to any such Prize Notification, or declines the Prize for any reason, the Prize will be forfeited and, at Sponsor’s sole discretion and time permitting, Sponsor may randomly select an alternate potential winner from among all remaining entries or void the Prize. Noncompliance with these Official Rules or the return of the Prize (or any portion thereof) or Prize Notification as undeliverable may result in disqualification and Prize forfeiture and, at Sponsor’s sole discretion and time permitting, may cause an alternate potential winner to be randomly selected from among all remaining entries. Participants acknowledge that (a) it is their responsibility to check their phone and to ensure they receive and answer any phone call from Sponsor in connection with this Sweepstakes, and (b) Sponsor will not be held responsible for any failure by the Winner to timely claim the Prize in connection with the Winner’s failure to receive any call transmitted by Sponsor. Verification Paperwork: Sponsor may require the potential winner to provide his/her mailing address, telephone number, and other contact information, an executed (and if required, notarized) Affidavit or Declaration of Eligibility and Liability/Publicity Release, and a completed W-9 tax form (collectively, the “Verification Paperwork”) in order to receive the Prize. Sponsor may, in its sole discretion, post the verified winner’s name on the Sponsor’s and/or Lightning’s website, including https://www.amaliearena.com/ and https://www.nhl.com/lightning and on or in any of the Sponsor’s and/or Lightning’s social media pages or channels. Promotional Usage of Likeness. By accepting Prize, Winner agrees to award Sponsor and/or Lightning the right to publicize his or her name, photographs (including the use and appearance of his or her photograph on Sponsor’s and/or Lightning’s website/social media pages or channels), likeness, biographical information, e-mail address, voice and details of winning for purposes of this and future promotions without further compensation, except where prohibited. Participant Warranties and Representations. By entering into the Sweepstakes and submitting an entry, each participant agrees to be bound by these Official Rules and warrants and represents that he/she is eligible to enter the Sweepstakes in accordance with any and all applicable law and these Official Rules. LIMITATION OF LIABILITY & DISCLAIMER OF WARRANTIES. The term “Released Parties” shall mean (a) TBA; (b) Lightning; (c) the National Hockey League (“NHL”), NHL Enterprises, L.P., NHL Enterprises Canada, L.P., NHL Enterprises B.V., NHL Interactive CyberEnterprises, LLC, National Hockey League Foundation, NHL Foundation, each of the other thirty (30) member clubs of the NHL, and each of their respective subsidiaries or affiliated entities, including any entity which, now or in the future, controls, is controlled by, or is under common control with the NHL or any of its member clubs, and the directors, officers, employees, partners, shareholders, owners and agents of the above entities (collective, the “NHL Entities”); (d) WTSP; (e) any other company involved in the development or administration of the Sweepstakes; and (g) their respective parent companies, subsidiaries, agencies, affiliates, franchisees, promoters, prize suppliers, directors, officers, employees, agents and related persons. By participating in the Sweepstakes, you agree that the Released Parties: (a) are not responsible for technical failures of any kind, including but not limited to lost, disconnected, interrupted, or unavailable network, server, or other connections, late, lost, undeliverable, damaged or stolen mail, or for any failed telephone or computer hardware or software, or for any failed, delayed, misdirected, corrupted, or garbled transmissions or errors of any kind, whether human, mechanical, or electronic; (b) are not responsible for any incorrect or inaccurate information, whether caused by participant or other participant’s, printing, typographical or other errors or by any of the equipment or programming associated with or utilized in the Sweepstakes, the printing of this offer, the administration of the Sweepstakes, the selection or announcement of the Winner or Prize; (c) are not responsible for any injury or damage to any computer, modem or other electrical device as a result of participation in the Sweepstakes or downloading of any software or materials; (d) are not responsible for unauthorized human intervention in any part of the Sweepstakes; (e) are not responsible for any unauthorized third-party use of any entry materials; (f) are not responsible for the inability to select the Winner because of postal failure, equipment failure, or data storage failure; and (g) are not responsible for any printing, typographical, technical, computer, network or human error that may occur in the administration of the Sweepstakes, selection of Winner, verification of the Winner, the Prize or otherwise in any other Sweepstakes and/or Sweepstakes-related materials. RELEASED PARTIES EXPRESSLY DISCLAIM ALL WARRANTIES OF ANY KIND (WHETHER EXPRESS, IMPLIED, STATUTORY OR OTHERWISE), INCLUDING BUT NOT LIMITED TO, IMPLIED WARRANTIES OF MERCHANTABILITY, FITNESS FOR A PARTICULAR PURPOSE, AND NON-INFRINGEMENT. RELEASED PARTIES SHALL NOT BE LIABLE OR RESPONSIBLE FOR THOSE GUARANTEES OR WARRANTIES MADE OR OFFERED BY ADVERTISERS, PARTNERS, MANUFACTURERS OR SUPPLIERS, INCLUDING THOSE RELATED TO prize. UNDER NO CIRCUMSTANCES SHALL RELEASED PARTIES BE HELD RESPONSIBLE OR LIABLE FOR YOUR USE OF THE INFORMATION AND/OR PRODUCTS PROVIDED AND/OR MADE AVAILABLE THROUGH THE SWEEPSTAKES OR FOR ERRORS OR ANOMALIES RESULTING IN THE UNINTENDED OR ERRONEOUS PARTICIPATION, AWARD OF THE prize OR OTHER BENEFITS UNDER THESE OFFICIAL RULES. RELEASED PARTIES OFFER NO ASSURANCES, GUARANTEES OR WARRANTIES THAT THE SWEEPSTAKES PAGE OR RELATED WEBSITES WILL BE UNINTERRUPTED OR ERROR-FREE AND DO NOT GUARANTEE THE ACCURACY OR RELIABILITY OF ANY INFORMATION OBTAINED THROUGH THE SWEEPSTAKES. By participating in the Sweepstakes, you agree to release and hold Released Parties harmless from all alleged, existing, or future actions, claims, and/or liabilities of whatever nature including, but not limited to, personal injury, bodily injury (including, without limitation, wrongful death and disability), property damage, and expense (including, without limitation, reasonable attorneys’ fees) and loss or damage of any other kind, relating to or arising from, in whole or in part, directly or indirectly, (a) your participation, or inability to participate, in the Sweepstakes, or any Sweepstakes-related or Prize-related activity; (b) the use by Released Parties (including modification, adaptation, and reproduction) of entry materials during or after the Sweepstakes; (c) the delivery, acceptance, possession, redemption, use, misuse, loss, or misdirection of the Prize; and (d) any other claim or cause of action you may have against any Released Party. BY PARTICIPATING IN THE SWEEPSTAKES, you FURTHER AGREE THAT (A) ALL DISPUTES, CLAIMS, AND CAUSES OF ACTION ARISING OUT OF OR CONNECTED WITH THE SWEEPSTAKES OR THE PRIZE, SHALL BE RESOLVED INDIVIDUALLY, WITHOUT RESORT TO ANY FORM OF CLASS ACTION; (B) ALL CLAIMS, JUDGMENTS AND AWARDS SHALL BE LIMITED TO ACTUAL OUT-OF-POCKET COSTS INCURRED, INCLUDING COSTS ASSOCIATED WITH ENTERING THE SWEEPSTAKES, BUT IN NO EVENT ATTORNEYS' FEES; AND (C) UNDER NO CIRCUMSTANCES WILL YOU BE PERMITTED TO OBTAIN ANY AWARD FOR, AND you HEREBY WAIVE ALL RIGHTS TO CLAIM, PUNITIVE, INCIDENTAL OR CONSEQUENTIAL DAMAGES, ALL RIGHTS TO HAVE DAMAGES MULTIPLIED OR OTHERWISE INCREASED, AND ANY OTHER DAMAGES OTHER THAN ACTUAL OUT-OF-POCKET EXPENSES. WITHOUT LIMITING THE FOREGOING, BY PARTICIPATING IN THE SWEEPSTAKES AND/OR ACCEPTING THE PRIZE, you RELEASE, FOREVER DISCHARGE, COVENANT NOT TO SUE AND HOLD HARMLESS RELEASED PARTIES FROM ALL CLAIMS, DEMANDS, DAMAGES, LOSSES AND LIABILITIES OF ANY NATURE WHATSOEVER, WHICH YOU MAY NOW OR HEREAFTER ASSERT. SOME STATES DO NOT ALLOW LIMITATIONS ON THE ABILITY TO PURSUE CLASS ACTION REMEDIES, OR ON CERTAIN KINDS OF DAMAGES, SO THE ABOVE LIMITATIONS OR EXCLUSIONS MAY NOT APPLY TO YOU IN WHOLE OR IN PART. Sponsor reserves the right to cancel, suspend or terminate the Sweepstakes, or other part thereof, if Sponsor determines, in its sole discretion, that the security, administration, fairness and/or operation of the Sweepstakes has been corrupted or impaired by any non-authorized intervention, network failure, information storage failure, telecommunications failure, malfunction, or any other cause beyond Sponsor’s control. In such an event, the Sponsor will post notice at its website and select the Winner at random from all non-suspect entries received prior to the suspension, cancellation or termination of the Sweepstakes or in such other manner as Sponsor, in its sole discretion, deems fair and appropriate under the circumstances. Sponsor reserves the right to disqualify any individual from further participation in the Sweepstakes if Sponsor concludes, in its sole discretion, that such person (a) has attempted to tamper with any entries or the operation of the Sweepstakes, (b) has repeatedly disregarded or has attempted to circumvent these Official Rules, or (c) has acted towards Sponsor or any other participant or person in an unfair, inequitable, deliberately annoying, threatening, disrupting or harassing manner. Tampering includes attempting to submit entries except as permitted herein, including by using any prohibited device or method. Any failure by Sponsor to enforce any of these Official Rules shall not constitute a waiver of such Official Rules. ANY ATTEMPT BY ANY INDIVIDUAL TO DEFRAUD, TAMPER WITH, OR DELIBERATELY UNDERMINE, THE LEGITIMATE OPERATION OF THE SWEEPSTAKES MAY BE A VIOLATION OF CRIMINAL AND/OR CIVIL LAWS AND SPONSOR RESERVES THE RIGHT TO PURSUE ANY AVAILABLE DAMAGES OR REMEDIES AGAINST SUCH INDIVIDUAL AND/OR REFER SUCH MATTERS TO LAW ENFORCEMENT FOR PROSECUTION TO THE FULLEST EXTENT PERMITTED BY LAW. All activity arising out of and relating to the Sweepstakes, including any reference to the status of any person as a "winner" is subject to verification and/or auditing for compliance with the Official Rules. If Sponsor determines, in its sole discretion, that verification or auditing activity evidences non-compliance of an entry and/or participant with the Official Rules, Sponsor reserves the right to disqualify such entry and/or participant from the Sweepstakes and prize at any time. Sponsor reserves the right to conduct a background check on any potential winner and to disqualify any individual based on such background check if Sponsor determines in its sole discretion that awarding a Prize to any such individual might reflect negatively on Sponsor. Each participant agrees to cooperate with Sponsor and its representatives in connection with all verification, auditing and/or background check activities. Sponsor reserves the right to correct typographical, printing or clerical errors in any Sweepstakes-related materials. No more than the stated number of Prizes will be awarded. If production, technical, seeding, programming or any other reasons cause more than the stated number of Prizes as set forth in these Official Rules to be available and/or claimed, Sponsor reserves the right to award only the stated number of Prizes by a random drawing from among all legitimate, un-awarded, eligible Prize claims. All issues and questions concerning the construction, validity, interpretation and enforceability of these Official Rules, or the rights and obligations of the participant’s or Released Parties in connection with the Sweepstakes, shall be governed by Florida law, without giving effect to any choice of law rules that would cause the application of the laws of any jurisdiction other than Florida. Arbitration: Except where prohibited by law, by participating in the Sweepstakes, you expressly agree that (a) all disputes and causes of action arising out of or connected with the Sweepstakes or the Prize shall be resolved individually, without resort to any form of class action, and exclusively by final and binding arbitration under the rules of the American Arbitration Association (“AAA”) in accordance with its Commercial Arbitration Rules in Tampa, Florida; and (b) judgment on the award rendered by the arbitrator(s) may be entered in any court having jurisdiction thereof. By participating in the Sweepstakes, you expressly (a) agree that any legal proceedings arising out of or relating in any way to the Sweepstakes or these Official Rules shall be brought only in the federal or state courts located in Hillsborough County, Florida, and (b) consent to the mandatory and exclusive jurisdiction in such courts with respect to any such legal proceedings. In the event of any discrepancy or inconsistency between any terms or conditions of these Official Rules and any disclosures or other statements contained in any other Sweepstakes-related materials, including but not limited to television, print, mobile or online advertising, the terms and conditions of these Official Rules shall prevail, govern and control. If any provision of these Official Rules is determined to be invalid or otherwise unenforceable or illegal, these Official Rules shall otherwise remain in effect and be construed in accordance with their terms as if the invalid or illegal provision were not contained herein. NHL ENTITIES (DEFINED ABOVE) WILL HAVE NO LIABILITY OR RESPONSIBILITY FOR ANY CLAIM ARISING IN CONNECTION WITH PARTICIPATION IN THE SWEEPSTAKES OR THE PRIZE. THE NHL ENTITIES HAVE NOT OFFERED OR SPONSORED THE SWEEPSTAKES IN ANY WAY. Tampa Bay Lightning trademarks and copyrights are the property of Tampa Bay Lightning. All Rights Reserved. Any third-party trademarks mentioned herein are the property of their respective trademark owners and the use or mention of any such third-party trademarks in these Official Rules or in the Sweepstakes is solely for descriptive purposes and shall in no way imply an endorsement or sponsorship of the Sweepstakes. For a copy of the Official Rules of the Winner’s name, send a self-addressed, stamped envelope to Amalie Arena c/o Lightning Playoff Ticket Sweepstakes, 401 Channelside Drive, Tampa, Florida 33602, specifying either “Winner’s Name” or “Official Rules”. Winner’s name will be available after April 30, 2019. Sponsor. Tampa Bay Arena, L.P. d/b/a Amalie Arena, 401 Channelside Drive, Tampa, FL 33602.